Blog | The CGS Unit | Sharing our love of Crafts, Games, and SCIENCE with the world! So it seems that trying to finish a PhD and keeping up with newsletters are mutually exclusive. For those of you who have been wondering where we are, rest assured that we have still been working on games, just not at quite the same pace I would have liked. Since the last blog post in August, I applied to dozens of jobs and got the one I was most excited about! I’ll be starting a career at Grand Rapids Community College in the Fall, so I’ll be moving from Boston over the summer. I’m also weeks away from my dissertation defense, so you likely won’t hear from me again until June at the earliest. For the keen-eyed among you, you may have seen the additional tab at the top of the website for Match Quilt, the new card game that uses the “C” and “G” from CGS. I’ll be debuting a prototype at Unpub 6 in Baltimore on April 9-10. Stop by (it’s free) and check it out and the latest version of Stars, Inc., too! Well, this summer has been pretty busy, hasn’t it. Our grand view of a monthly newsletter seems to have begun and ended with April’s edition. We’ll see about putting something together for September. Speaking of September (it’s almost as if I planned that segue), did you know that we’re going to be back* in the Boston Festival of Indie Games Tabletop Showcase? That’s right! 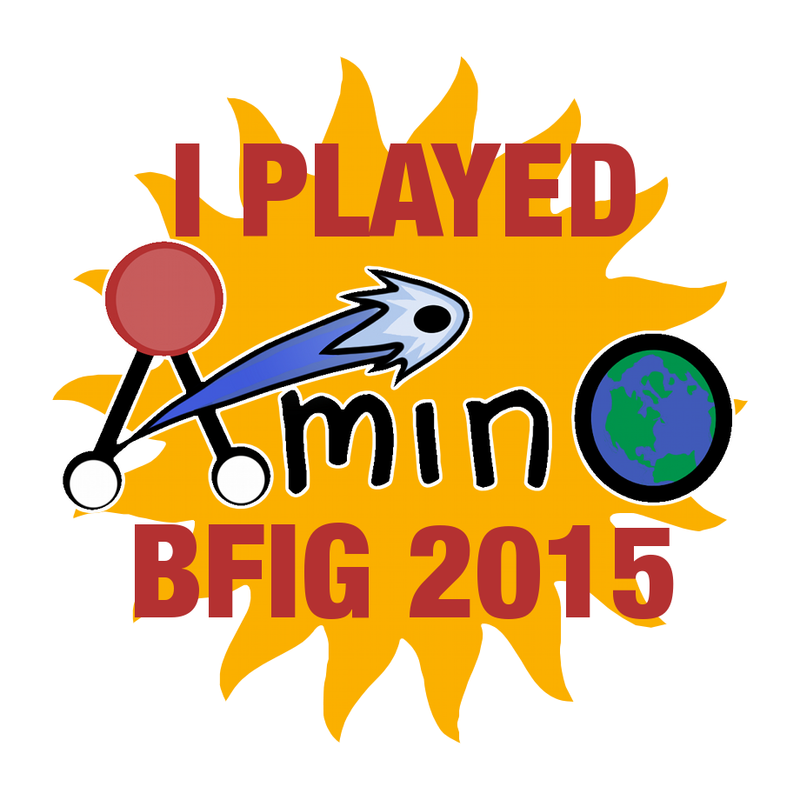 Amino made it through the two-phase selection process to be featured among the 48 new indie games at this year’s BFIG. We will be at the festival on September 12th from 10:00am to 8:00pm showing off our wonderful card game. We’ll also be selling a very limited number of printed copies there, letting you know where to buy it if you miss the limited run, and handing out stickers to anyone who sits down to play a hand! And you definitely want these stickers. So if you’re in the area, please stop by to check out the completed Amino, so you can say that you played it at BFIG 2015. 1.5″ stickers available at BFIG 2015. Logo for Amino by Marianna Burgett. *We also made it into the Tabletop Showcase at BFIG 2014 with Stars, Inc.! Here’s the link to the latest news. To get our monthly newsletter straight to your inbox, sign up here! So, Unpub 5 was AMAZING and I am so grateful to all of the fantastic playtesters and fellow independent game designers that I met last weekend. This weekend, I’ll have both Stars, Inc. and Amino! at BOSKONE 52. I was there this afternoon, and will be back from 10am to 3pm Saturday and Sunday. Stop by if you’re attending! With two weekends of conventions back to back, things have been a little crazy! We have had a great start with the campaign for Amino! and over half of the early-bird rewards have been claimed. We will need your help to succeed, though, so please share the project with your friends: https://www.kickstarter.com/projects/cgsunit/amino-the-card-game. I am so pumped up for today. Unpub 5 is open to the public in less than two hours. We’ll have a table for Stars, Inc. and Amino! there. In less than eight hours, I’ll be hitting the launch button for Amino! on Kickstarter!! I have been doing so much background work to make sure I am prepared for the twists and turns of running a tabletop campaign. I’ve been on the backer side of things dozens of times, but it’s not as easy to see the amount of work that goes into it from that end of the table. One of the many places I’ve found for advice is a website for small business that posted a sweet infographic that I wanted to share with you all. Make sure to check out our project! Link is at the far right under crowdfunding campaigns, and also at tiny.cc/fund-amino (after 4:00 EST today).